Paris - The Comédie Française in Paris is one of the most important and historic performing arts institutions in the world, and since 2013, is now operating with Tannoy’s innovative QFlex beam-steering technology in its main theatre. The history of this historic French institution is threefold. It is the history of a company, the history of its theatres and the history of its repertory. The Comédie-Française was born in 1680, the century of Louis XIV - the Sun King – a ruler whose passion was deeply entrenched in the performing arts. The list of actors and productions that have performed in this historic space is the stuff of legends, and indeed, that kind of standard of performance is still going on to this very day. 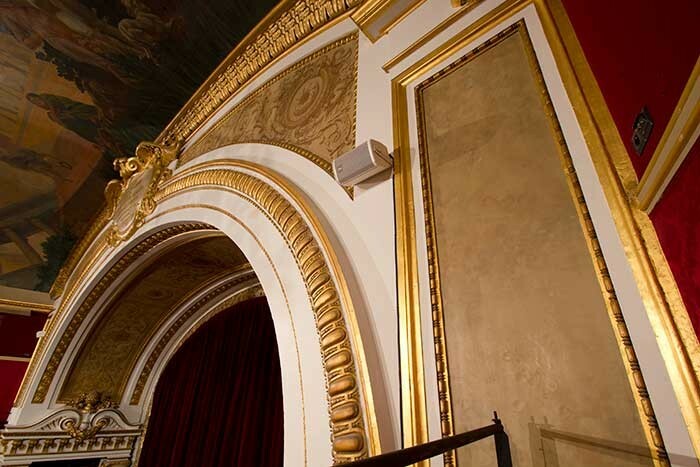 In recent times, the theatre went through one of its most important renovation programs ever. Closed for around a year, Richelieu Hall – the main theatre space – had to undergo an extensive refurbishment to bring back both the aesthetic and sound quality lost over the years following the previous transformations. Originally built in the neoclassical and enlarged under the Second Empire style, it has undergone many transformations in its history in order to meet the requirements of the nineteenth and twentieth centuries in constant search of comfort for spectators. This meant the space being revamped over time to include a host of different features (velvet carpets, satin, etc) However, these historical changes gradually to a significant reduction of the acoustic qualities of the room, which in turn caused problems for both actors and audiences alike. With the recent restoration, the main focus was to restore the room to its former glory, both acoustically and aesthetically, bringing back that original charm and magic of this unique space. These renovations, entrusted to the Department of Building and Facilities of the Comédie-Française and its director Sophie Bourgeois, was made in consultation with the Chief Architect of Historical Monuments. And of course, with this kind of breathtaking, historically important, architecture in mind, it was important to find a loudspeaker solution that would match the needs of both the audiences and performers alike, at the same time being architecturally sensitive. French company DV2 was commissioned to design, supply and integrate a new sound system with all of these considerations in mind, and they found the perfect solution in Tannoy’s digitally steerable, multi-channel, column array loudspeaker system. The technology within QFlex means the system is able to achieve even, full-range coverage and SPL which is maintained across the listening plane, and can create an asymmetrical pattern to allow similar SPLs in both the near and far field. It can steer focused beams of acoustic energy to frequencies beyond 12 kHz, which makes it suitable for full-range musical material as well as spoken word. An ideal choice then, for Comédie-Française. The modular nature of QFlex means that integrators can choose a specific size of array according to their needs, and after careful consideration and testing the team at DV2 settled on two QFlex 48s, mounted discretely on either side of the stage. 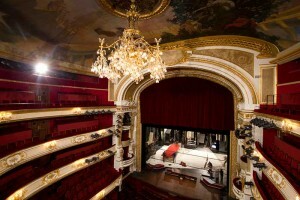 These units perfectly blend with the elaborate white and golds of the stage surround, and with the steerable nature of the internal drive units, allowed DV2 and the staff of Comédie-Française to compensate for the challenging acoustics and reach each level of the steep incline of seating in the theatre. Nicolas Faguet, Sound and Video Manager for the venue, commented: "From the beginning, we knew we had limitations on what we could use to form the main sound system here, and when DV2 suggested QFlex from Tannoy, we were very interested to hear what it could do, and see it in place." A small series of custom-painted Tannoy VX 5.2s were employed as side fills to cover those seats right on the side of the stage at each balcony level, allowing for the same Tannoy sonic signature to be projected throughout. These are controlled by XTA processing, and amplified with Lab.gruppen C 20.8X amplifier, the most powerful eight-channel amplifier in the C Series family, delivering an impressive 8 × 250 W* at 4 ohms, 8 ohms, 16 ohms or 70 Vrms; 500 W at 100 Vrms is available in bridge mode. A pair of Adamson 115 and a pair of sub Adamson 215 subwoofers, artfully integrated, provide additional power and punch for those occasions where a particular performance needs extra impact. 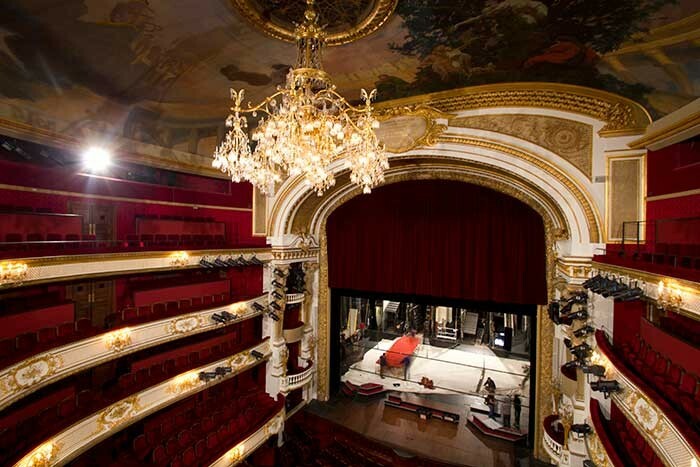 In summing up the use of Tannoy in Comédie-Française, Nicolas commented: "I have had some experience with beam steering before, but Tannoy is by far the best I have ever heard in terms of audio quality and intelligibility. From the time we reopened, it was clear that we had the perfect solution. Both the audiences who visit us daily and the guardians of the theatre have expressed their delight in what we have done, and QFlex is so discrete that I have heard people ask many times, ‘where is the sound coming from?’ – that to me is testament to their superior design, power and clarity."